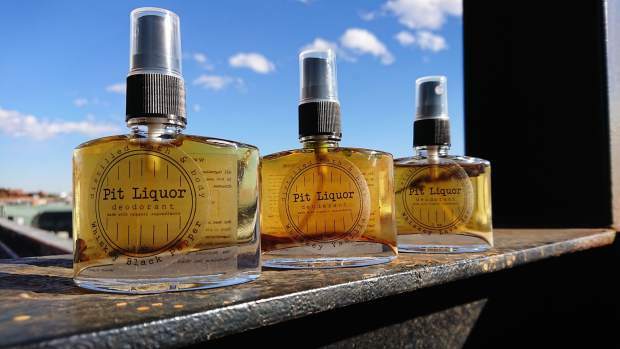 Reporter’s note: As Jason Feucht’s former high school soccer coach, I told him to take a lap, and then I’d write a story about Pit Liquor deodorant, if the deodorant works. It does. Here’s the story. Jason Feucht is so smart that he graduated a local high school and a couple of colleges with a bunch of Latin titles behind his name. Online at http://www.vaildaily.com is a video depicting Jason, one of the smartest people you could know personally, on Denver’s 16th Street pedestrian mall asking people to sniff his armpits. Go ahead and click on it. It’s worth the time. We’ll wait. As you learned from the video, and as the willing participants int he video quickly learned, Jason’s armpits do not stink. He is wearing a deodorant called Pit Liquor that he and his bride Erica concocted in their kitchen using whiskey, vodka, some herbs, spices and teas — and a bunch of solid science. Like we said, Jason and Erica are both wicked smart. They’ve been working on Pit Liquor for more than a year. It actually works. The most challenging part is getting people to believe it works, Jason said, which would explain his adventures on Denver’s 16th Street Mall. “Once someone is brave enough to try it, we have a customer for life,” Jason said. Jason started tinkering with deodorant stuff but got serious when Erica became pregnant with their baby girl, Eve. He spent six months researching and trying different natural ingredients on himself. He read textbooks about deodorant and armpits. Their Kickstarter page contains a video of Jason geeking out and talking about all the aspects of armpit odor and how to prevent it. They tried hand sanitizer, but that would be boring, and boring is bad. So, after lots of experiments, they settled on whiskey from Bear Creek Distillery in Denver. Bear Creek uses organic ingredients, and they make a darned fine whiskey if you want to use it for more traditional purposes. “I have 45 gallons of hard liquor at my house, and I don’t drink much anymore,” Erica said with a laugh. Bear Creek’s whiskey is 50 percent alcohol. Jason and Erica mix it with vodka, which is more than 90 percent alcohol. That puts them at the necessary alcohol content for their deodorant. “I felt I was committing sacrilege,” Erica said. Initially, Jason experimented on himself, spraying whiskey and vodka on his armpits, which was pretty entertaining. He didn’t tell Erica that he had stopped washing his armpits three months earlier. “He didn’t stink at all,” Erica said, which is not the sweetest thing she has ever said about her beau, but it’s on point for Pit Liquor. “The proof is in the armpit,” she said. They enlisted a bunch of friends for product trials — yoga instructors, Navy personnel and, eventually, willing strangers. They take a hard line about being organic, natural and effective. Unlike lots of start-ups, they don’t boost their Facebook numbers by paying for posts. Their reviews are from strangers, who have nothing to gain. Their Kickstarter campaign just topped 100 backers, so you could say their upstart deodorant company is rolling right along. The plan is to buy 50-gallon drums of booze, but they need a little help for that. Pledge $7, and you’ll get a shot of Pit Liquor. Pledge $10,000, and they’ll fly you to Colorado for a weekend of skiing in Vail. Right now, the deodorant is available on their website. They’re trying to get it on the shelves at stores with organic retail. They’d like to stay small, but if they sell millions of dollars worth of this stuff, then that would be OK, too.